In popular culture, the Renaissance papacy (c. 1417-1534) seems an intriguing mixture of highs and lows. On the one hand, it dazzles us with artistic achievements — the Sistine Chapel and St. Peter’s, to name but two. On the other, it shocks us with personalities infamous enough to thrive on cable television (“The Borgias,” anyone?). While this blend of extremes may draw us to the Renaissance papacy, how much can it actually teach us? A great deal, in fact. This lecture tours the good, the bad and the ugly of this period in papal history and, in so doing, illuminates how this era represented a turning point for the Western Church. 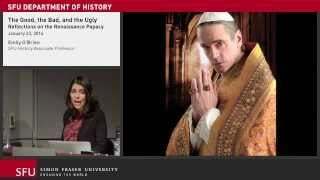 Emily O’Brien studies the Italian Renaissance with a particular focus on humanism and the Renaissance papacy. Her work so far has centred on the fifteenth-century humanist Aeneas Sylvius Piccolomini (later Pope Pius II) and more specifically, on his autobiography and best-selling romantic novella. She is currently working on a book manuscript about Pius’s autobiography and on a Latin-English edition of his (and other humanists’) novelle.